People who are planning to undergo laparoscopy should understand that the procedure uses a laparoscope and specialized surgical instruments inside the patient’s abdomen, it can help diagnose and treat the cause of infertility and other health conditions, extensive preparations have to be made prior to the procedure, and the patient’s abdomen will be filled with carbon dioxide gas to make room for the laparoscope. The surgical procedure that involves the insertion of a laparoscope into a small cut made in the abdomen is called laparoscopy. Doctors use laparoscopy to observe a patient’s internal organs in the abdomen or make repairs to them without having to make large incisions that could require longer healing time or more specialized hospital treatment. You need to understand some important things about laparoscopy if you are considering going through a medical procedure that uses it, such as laparoscopic fertility surgery. During the surgical procedure, a doctor makes a couple of small cuts in the patient’s abdomen where a laparoscope and other specialized surgical instruments are to be inserted. The laparoscope is an instrument equipped with a fiber-optic tube, a camera and a light. All of the instruments help the doctor look at the patient’s abdominal organs. Some fertility doctors usually employ laparoscopy to diagnose and treat the possible causes of a patient’s infertility. But this surgical procedure is usually conducted only after other diagnostic measures for infertility have been performed. Additionally, some causes of infertility, such as endometriosis, can only be identified using laparoscopy. Doctors may also use laparoscopic surgery to biopsy suspicious cysts or identify if internal pain experienced by patients is a symptom of a more serious medical condition. For instance, if a patient has pelvic pain, the doctor may use laparoscopic surgery to find the cause of pain and, possibly, administer treatment, like removing scar tissue. The doctor will usually orient the patient regarding the different preparations that need to be made before the surgery. Usually the patient will not be allowed to eat or drink for 8 or more hours before the procedure. The patient may also be asked to take antibiotics. General anesthesia will also be administered. Patients are usually given fluids and medications that help induce relaxation through an IV. Usually, patients are asleep during the course of the surgery. It is important that there is enough room in the patient’s abdomen to accommodate the laparoscope and the other surgical instruments used during the procedure. To do this, the doctor will make a small cut in the patient’s abdomen right after the anesthesia has taken effect. 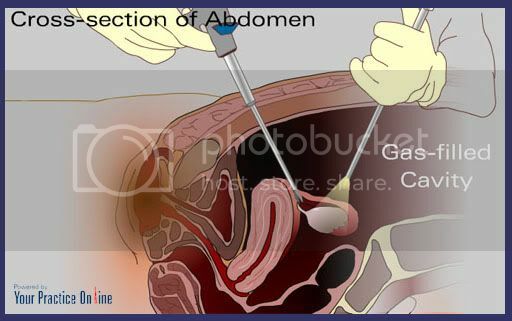 After the cut is made, the abdomen is then filled with carbon dioxide using a needle that is inserted into the cut. The doctor will then insert the laparoscope into the cut and use it to observe the different internal organs or biopsy tissues. In some cases, additional cuts have to be made in order to accommodate other surgical instruments needed for treating or making repairs. Understanding the different aspects and procedures in laparoscopy will help patients have insight on the necessary preparations and risks involved in the surgery. Sounds familiar--I had this done a few weeks before Thanksgiving. I hope everything goes well for you and you get some good answers...they found endo but weren't able to remove it during my procedure. Make sure you baby yourself and rest, rest, rest! ouch! Reminds me of my daughters appendicitis surgery. Hey I found your blog on FMBT but I'm going to be having that same procedure done here in the next month or so. I'm also going through weight loss and PCOS issues. I'm going to follow you (sounds stalkerish doesn't it! sheesh) and look forward to hearing how you're progressing!